Whoa, look at the size of those dandelions! Never seen anything like those in real life. In real life, plants are important in nature. They provide oxygen, pollen for bees, food for herbivores and they make your garden look nice. In fiction, however, things can get much more diverse and much, much stranger. Fantasy and sci-fi writers like to create their own unique plants with bizarre appearances and properties. Some may be carnivorous, fast-growing, explosive, springy, fiery, or even sentient. You get the idea. They're very strange plants. They may be magic or found on alien planets or in other dimensions. If someone can control these things watch out. In some cases, they don't have to be any particularly wild properties, and are more or less just analogues for real plants or fruit, but they're still called something fantastic. The IQ plants, which stimulate evolution in animals that eat it. Dr Indigo used them to create SIQ. Some of Usopp's Pop Greens become very bizarre plants such as a bush that grows into a wolf and the bulb releases a 3 meter diameter shock wave. Hellstar Remina is covered in this and it all wants to murder you. Much like the rest of the planet. Almost everything living below the surface and uppermost layers of the cavern in Made In Abyss. The Eternal Fortunes are a mild example, since they're normal-looking flowers whose only fantastic characteristic is being able to survive extreme environments. Further down, there are trees shaped like umbrellas pointed toward the center of the Abyss, and enormous "goblets" made from two different organisms living in a symbiotic relationship. The latter can be dangerous, as they fill with acid when young. Pleasant Goat and Big Big Wolf: In Pleasant Goat Fun Class, the plants are shaped like perfect circles and curved rectangles ◊, which is not quite how plants look in real life. In Tooth and Claw there are "mineral gardens" where plants made of stone and metal somehow grow. Their "flowers" appear to be gemstones. It's a Dangerous Business, Going Out Your Door: Magivascular plants, a small group of plants that have a secondary vascular system that draws magic instead of nutrients or water, resulting in innately magical organisms. Examples include the beneviolet (a very powerful Healing Herb) and the canon plant poison joke (a flowering weed that causes a random, sadistically humorous transformation in whoever touches it). In Zootopia, the Night Howlers ability to induce savagery in any animal is central to the plot. The flowers are distilled into a Psycho Serum that is used to target predators which allows Bellwether to rise in power. In a Czech movie Adele Hasn't Had Her Dinner Yet, the villainous Gardener grew many fantastic plants: A flower with human-like eyes that sheds tears; a flower with pollen that makes people freeze on spot immediately; a rose that can pour tea from a pot to cups, or cut its own rosebud with a pair of scissors and give it to a lady as a present. He also cultivated fast-sprouting beans used to rob apartments or a rose that puts ladies into deep sleep, used to invoke a very sinister scheme. The highlight of his devilish greenhouse is a carnivorous plant Adele that eats sausages, mice, dogs and people. In Big Top Pee-wee the title character is cultivating a hot dog tree, which is technically a bush, but does somehow grow hot dogs. Halfway through the movie he makes a mistake and the hot dogs shrink, giving him one that grows cocktail wieners. In Harry Potter, there are various fantastic plants, such as the mandrake roots that look like human beings and can kill people with their cry, the gillyweed, that helps Harry breathe underwater, and the Mimbletonia, Neville's pet plant. In The Stormlight Archive, the world of Roshar is entirely dominated by the massive Highstorms, violent hurricanes which every few days scour the land to bare rock. In the face of this, Roshar's vegetation has become more analogous to coral or sea anenomes than terrestrial vegetation, extending leaves or tendrils when the weather is fair and then retracting them when danger threatens. For another example, the main food grain of Roshar is something called lavis, which, instead of growing a head of grain the way terrestrial grain does, possesses a head-sized shell of stone-like substance within which the grains grow, suspended in a sand-like medium. The Aralorn Series by Patricia Briggs mentions the coralis tree that attracts butterflies with its blossoms, then closes the petals above them, and digests them. Unusual plants play a large part in the adventures in The Mysterious Benedict Society, thanks in part to Sticky's particular talent for recognizing the obscure plants he's read about in his books. In the original The Mysterious Benedict Society book, he discovers the traps on Nomansan Island thanks to them being hidden by drapeweed, a rare shade loving type of ivy. Later, it's Sticky's having spotted a patch of "wild chuck-root" (Euphorbia upchucuanhae) that helps the group in their plans, when they use it to give a bellyache to pretty much everyone in the Institute so that Reynie and Sticky can get their turns in the Whisperer sooner. The second book, The Mysterious Benedict Society and the Perilous Journey, is itself focused largely around Mr. Benedict and his evil twin's attempts to acquire another rare plant, duskwort, which has the potential to cure their narcolepsy when mixed when other substances. In its normal form, however, it's an extremely potent plant that, when burned, releases smoke that can put entire villages to sleep, but it only thrives under very specific conditions. However, it it easily overtaken by thwart-wort, a clever mimic that looks just like it, but has none of the same useful chemical properties. In the Inheritance Cycle by Christopher Paolini, a group of spirits transform a lily into precious metals, including a golden stem, silver-wire hairs, white gold petals, and other flower organs carved from rubies. Eragon and Arya discover in short order that the metal flower is still alive, and Arya hypothesizes that it is also fertile and capable of producing seeds that would grow into more golden lilies, though the latter is never confirmed. Eternal Sonata has the Heaven's Mirror, a flower that hides in its buds during the daylight and releases it all in a brilliant display at exactly 2 A.M. in the morning, symbolic of the playable character Polka, and the time of death of the famous real-life composer and playable character Frederic Chopin. There's also the Simile flower, which only blooms with water from Simile Spring, but wilts if you water it with regular water. Tales of Graces has the Sopheria flower, which Sophie is named after. When it blooms, its seeds glow a bright pink and rise into the air spontaneously. The Deep Jungle world of the first Kingdom Hearts game has an area with flowers that change color depending depending on which spell is cast on them. They turn black if Heartless are nearby and disintegrate if they stay there. You also have to destroy a giant bluish fruit that was apparently attracting Heartless. Wonderland has flowers that drop improved items if you give them a specific item and plants that summon treasure chests if you cast Thunder on them. The series also has Heartless based on plants. Psychonauts has several examples early on. Each stage — excluding the Hub Level — is a surreal Mental World tailored to a different character's personality, leading to oddities like a military-themed level with plants made from dogtags and barb wire. One of the Ages in Myst III: Exile consists of a gigantic hollow tree which hosts loads of examples of this trope, including plants that act like ladders, sun-focusing lenses, water pipes, trapeze lines, and an elevator. The Sun, a genetically created plant from House of the Dead III. The Cyclops Plant boss in Shantae and the Pirate's Curse is a giant plant with "jaws" that houses and protects a large laser-shooting, slime-dripping eye ball that serves as its main body. Subnautica contains copious quantities of this. A mushroom-like species that's full of caustic acid, kelp with seedpods that can be rendered down into silicone rubber, floating blue spheres held to the seafloor by netlike clusters of roots, bulb-shaped trees containing isolated mini-biomes that are stated to die off if the plant is pierced, ghostly white reeds whose roots grow pustules that are filled with a blood-colored, benzene-containing fluid, and many other equally unusual examples populate the world of 4546B. And all bioluminescent, including the potatoes. In Voyage Inspired By Jules Verne, the plants on the moon come in a variety of vibrant colours, and all seem to be predatory in nature, and quite hostile to anyone who approaches them. They also seem to be averse to certain types of each other, which the Selenites utilize to be able to walk among them without being attacked. Waking Mars is basically this trope: The Game. You as the player character grow and study increasingly unusual plant species in Lethe Cavern below the surface of Mars, though as your AI companion is quick to remind you, they're technically not plants. In "Bridle Gossip", the "leaves of blue" Zecora tried to warn the Mane Six about turn out to be the source of their strange conditions in the second half of the episode, and not any supposed "curse". The leaves belong to a patch of Poison Joke, a plant which causes humorous, often ironic afflictions on those who come in contact with it. 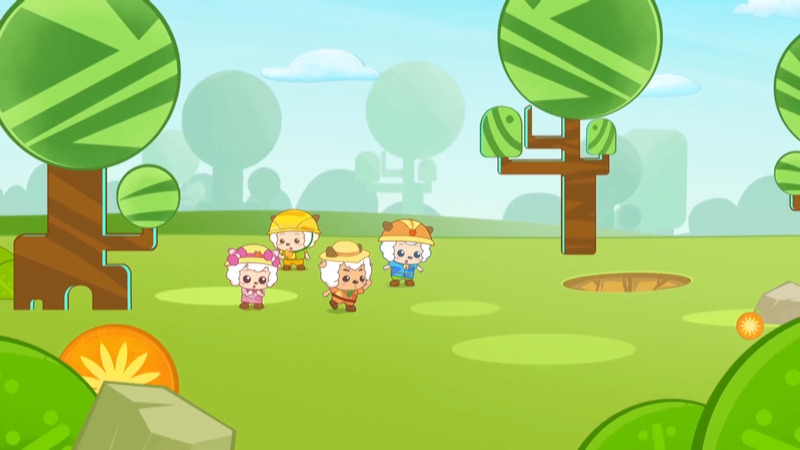 In "Family Appreciation Day", the older members of the Apple family are busy preparing to harvest Zap Apples, a magical variety of apple tree that only grows its rainbow-colored fruit, used to make Sweet Apple Acres' famous Zap Apple Jam, after a series of ominous signs (including a lightning storm and swarms of crows). 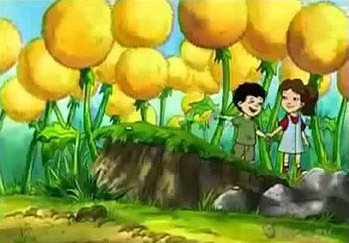 Dragon Tales had dragonberries, which all of the characters loved eating. Also, Dragon Land is loaded with unusual plants in general — the third season story "A Small Victory" features all of the main characters (and guest Lorca) searching for unusual flowers. The plants seen on the page picture are dande-lions, which can roar like real lions, but otherwise are basically just extremely large dandelions. Both of the later incarnations, Adventures in Care-a-Lot and Welcome to Care-a-Lot have delicious bumbleberries. On Care Bears & Cousins, the jealouspikle junipers seen in "BFFs" are strange spiky purple bushes that grow when someone is feeling jealous. However, they feed off jealous energy and so if that person stops feeling jealous, they eventually go away entirely. Numerous in PB&J Otter, including babbleberries, pompalopes, pompanuts and giggle melons. Most of these are just fantasy equivalents of real-world plants, but the giggle melons actually make you giggle when you eat them. "Garden Variety Pickle" on ToddWorld featured the kids in the main cast and Todd's dog Benny making an abandoned lot into a garden. They planted things such as glitter flowers, a flower that could eat rocks and a tree with several different types of dog biscuits. None of these, however, were the focus of the story. This instead, went to a small scraggly weed with no unusual properties that Pickle was caring for because he found it beautiful, the story having An Aesop about respecting how different things are beautiful to different people. In the Codename: Kids Next Door episode "Operation: T.U.R.N.I.P." the team fights a gigantic, tentacled, uh, turnip. The forgotten 1966 cartoon series of The Lone Ranger made use of this in the episode "Forest of Death", in which Tonto has to go after a mad botanist who wants to conquer the West with mutant plants he's bred. Some of the highlights include: lilies that release clouds of deadly poison when they open, a literal strangler vine, mangrove trees with hands on their roots that try to drown victims, cacti with instant-death poison on their needles that grow to maturity in seconds, lotuses that spit barbed dart-like seedpods (which grow into new lotuses within seconds of impact), and a giant, carnivorous flower that almost makes a meal out of Tonto. Ironically, the one plant experiment he failed at was his efforts to breed a Plant Person: his army of "treemen" turns out to be nothing but hired thugs in thick tree costumes. JoJo's Circus has merryberries, which JoJo is allergic to. Eating them causes her nose to swell and honk and her skin to turn pink and tingly. There's also the itchy ootchy scratch plants, which are basically a fast-acting fantastic flora version of poison ivy. When JoJo and Skeebo fall into a patch of these, they start itching all over. [happily] This little fella smells like battery acid! [equally happily] Looks like I lost my sense of smell. Ha ha ha! There have been studies to guess the color of the pigments used for photosynthesis that alien plants could have depending of what kind of star their planets would be orbiting. Planets orbiting hotter stars than the Sun would have plants of red, orange, and yellow colors and those around cooler ones would have plants of darker colors, up to and including black.